HAKODATE, HOKKAIDO - With the country’s catch of Pacific flying squid continuing to reach record lows, wholesale prices for the seafood have more than doubled for companies that process it into delicacies such as shiokara and what are normally inexpensive dried squid snacks. 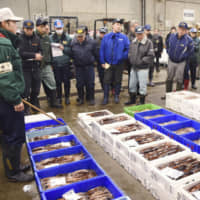 Not only has the scarcity in waters around Japan taken a bite out of profits, but the situation has grown dire as prices of foreign squid products have also skyrocketed because of a global slump in squid catches. For the time being, researchers predict difficulty in securing a recovery in seafood resources and a continued escalation in prices. In Hakodate, well-known as a “squid town,” Pacific flying squid are normally caught from June through January the following year. 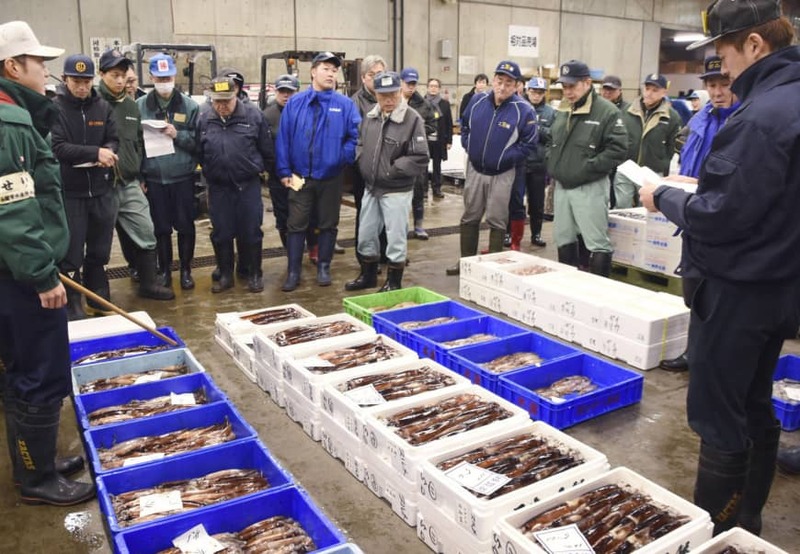 But according to the Hakodate Fisheries Cooperative Association, this season as many as 90 percent of about 20 small squid fishing vessels have stayed in port since mid-October. In 2017, the catch of Pacific flying squid was 61,000 tons, or 13 percent less than the previous year and less than 30 percent of the squid catch from 10 years earlier. In fact, it was the first time since 1956 that an all-time low was recorded for two consecutive years. In 2018 it was more of the same, with the pace falling below that of the previous year through the end of October. The average price of Pacific flying squid nationwide was once around ¥200 per kilogram, but since 2016 it has risen to more than ¥600. According to the National Cooperative Association of Squid Processors, a report from union members will be issued stating that the cost of squid procured from overseas has more than doubled from the average year. Along with the worldwide slump in squid catches, experts point to overfishing by South Korean and Chinese boats, as well as fears of illegal operations by North Korean vessels in Japan’s exclusive economic zone in the Sea of Japan. Yotchan Foods Co., a company based in Chuo, Yamanashi Prefecture, famous for producing dagashi cheap candies and snack food, had an effective price hike of its Cut Yotchan squid snack after changing its packaging to a uniform size last June — resulting in real price increases of 11 to 38 percent. Because of ballooning squid wholesale prices, the company has also done away with offering a free package to consumers who draw a prize from inside the bag. 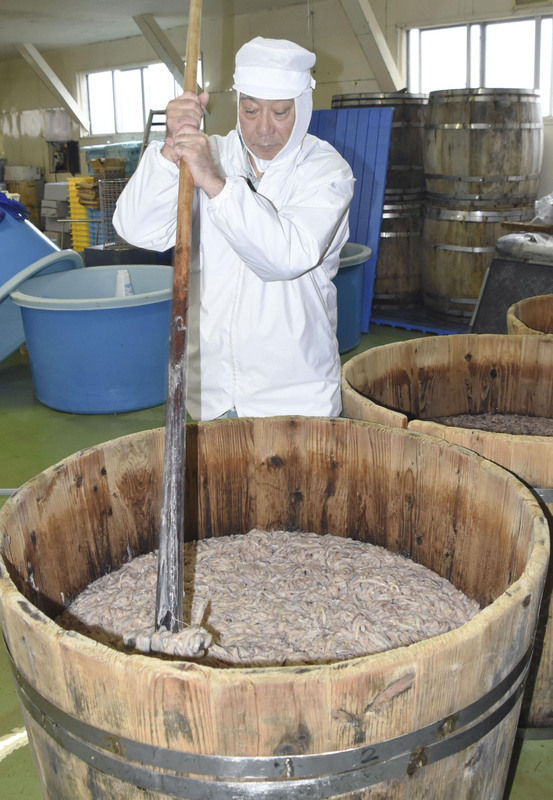 In Hakodate alone, there are as many as 70 seafood processing companies. But many of them are small and medium-size enterprises, some of which are betting their fortunes on changing to fish products other than squid to stay afloat. Mikiya, known for its shredded squid snack delicacies, had relied on products from its base in Hakodate but now must procure 20 to 50 percent of its squid from outside Japan, such as shortfin squid from Argentina. Indeed, in order to survive, companies like Mikiya are developing new products such as stingray fin jerky. But according to Tokyo Shoko Research Ltd., which conducts market research for businesses in Japan, about 70 percent of seafood processing companies in Hakodate are currently operating in the red. Shiokara, a Japanese cuisine consisting of salted, semi-fermented squid guts, is considered one of the chinmi (delicacies) of Japan. Yasunori Sakurai, a professor emeritus of Hokkaido University who specializes in cephalopods, says in recent years incubations have not gone well in the East China Sea, which is a spawning ground for Pacific flying squid. Colder than average temperatures there mean that fewer eggs are surviving in winter. “Because each year we see a drop in the resources of adult squids the poor catch looks like it will only continue,” he said.